The eight bodies were on an inflatable craft that can carry up to 120 passengers, said Colonel Fathi al-Rayani, head of the coastguard in Garabulli, 60 kilometres (40 miles) east of Tripoli. He estimated that "at least 100" migrants were missing. The boat was spotted deflated off Garabulli, and the coastguard found the bodies inside, said an AFP reporter who accompanied them. Conflict-ravaged Libya has long been a stepping stone for migrants seeking a better life in Europe. The UN refugee agency has said around 61,250 migrants have reached Italy since the start of the year after crossing the Mediterranean, while 1,778 more are dead or missing. The Italian coastguard has said that more than 900 migrants were rescued off Libya on Thursday and Friday. 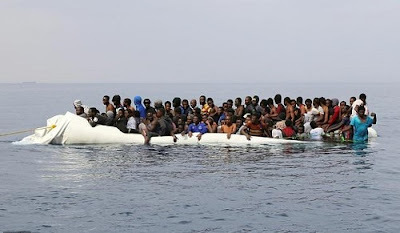 Libyan navy spokesman, General Ayoub Qassem, meanwhile told AFP that coastguards patrolling off Zawiya west of Tripoli on Friday intercepted five inflatables and two wooden boats with more than 570 migrants on board.